Classical music meets hip hop at PIANO SLAM, the third installment of The Dranoff Foundation mash up featuring the classical music of Gershwin, John Adams and Bach performed by award-winning pianists Stephanie Ho and Saar Ahuvia, mixed with the beats of DJ Brimstone 127! Also featuring Thomas Armour Ballet and the debut of works by Miami's hot young poets. 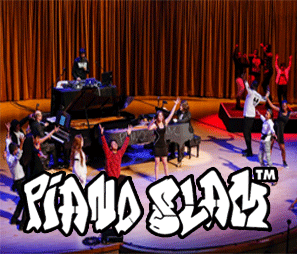 Recommended by the Miami Herald, PIANO SLAM is a fantastically hip musical showcase for the voices of Miami's youth by an extraordinary collaboration of talented international and local artists. Directed by award winning theater producer and playwright, Teo Castellanos. Video produced and directed by award winning filmmaker Richard Fendelman.